This September brings a new festival to Pittsburgh. The Re:NEW Festival celebrates creative reuse, with a monthlong line-up of exhibitions, performances, educational activities and events throughout Downtown Pittsburgh and surrounding areas. A highlight of Re:NEW is the North American premier of Drap-Art, an international show of art made from repurposed materials. 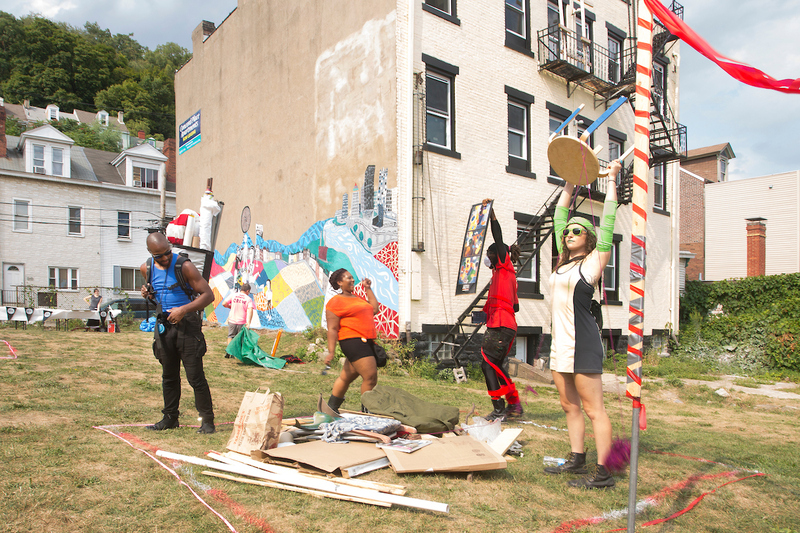 Re:NEW is the perfect venue for Art Olympics, my game-show style performance project that involves teams making sculptural works out of piles of junk over a two-hour period. Goodwill Industries is sponsoring the event, so teams will discover a plethora of old wooden furniture and well-used housewares as their building materials are unveiled. 2015 Art Olympics (Larry Rippel Photograph). The September 17th event will take place in a repurposed retail store in Downtown Pittsburgh. Art Olympics will take place on Saturday, September 17th from 6:00 PM to 9:00 PM at 623 Liberty Avenue, Downtown Pittsburgh. The show will be free to the public. Stay tuned for more information about teams, judges, and audience activities.